Everyday more companies are adopting or planning to adopt artificial intelligence as a growth tool in different industries. Counting on a wide range of applications, AI is set to be one the main business and social changing forces of the new digital age. Since 2005, artificial intelligence (AI) has been on a fast-growing streak as a collection of multiple technologies that enable machines to sense, comprehend, act and learn, either on their own or to augment human activities, and it has been figuring on many released trends to watch research notes and whitepapers from important organizations, such as Gartner, Forrester and IDC. Looking back the past 10-15 years, there has been a lot of work in developing different AI technologies by major market players, such as IBM’s Watson system and Google’s DeepMind’s AlphaGo system. Currently, thanks to Apple’s Siri, Microsoft’s Cortana, Google’s Google Assistant, and Amazon’s Alexa, consumers have easy access to a variety of AI-powered virtual assistants to help manage their daily routines and tasks. The potential uses of AI to identify patterns, learn from experience, and find novel solutions to new challenges continue to grow, as increasing investments will bring new AI technology advances to corporations and consumers. Further to that, AI is impacting many different sectors of the global economy and society in a very positive way, as humanitarian organizations are currently using intelligent chatbots to provide psychological support to Syrian refugees, and doctors are using AI to develop personalized treatments for cancer patients. There is no doubt that AI will bring a wide variety of applications within the next few years as its investments will continue to make this technology evolve, but still it is difficult to predict and forecast just how much value AI will generate to corporations and society. 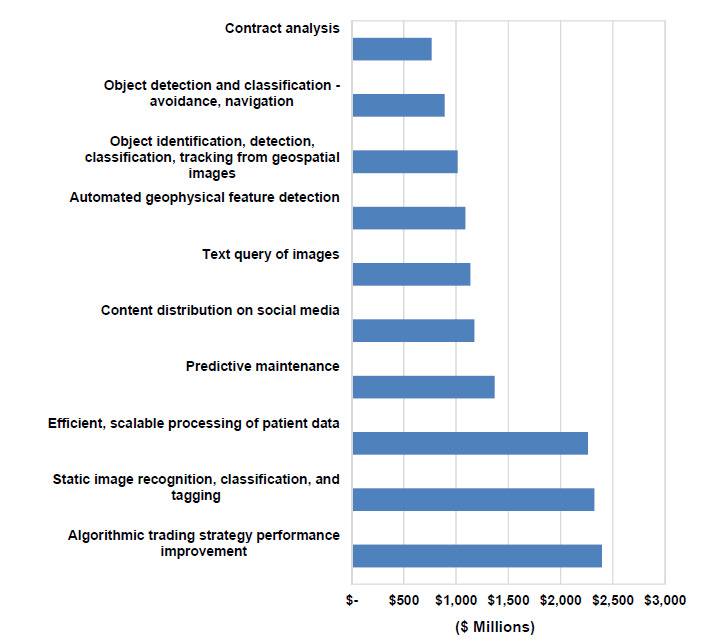 IDC estimates that the market for AI technologies that analyze unstructured data will reach USD40 billion by 2020, and will generate more than USD60 billion worth of productivity improvements for businesses per year only in the United States. The McKinsey Global Institute estimates that by 2025 automating knowledge work with AI will generate between USD5.2 trillion-USD6.77 trillion, advanced robotics relying on AI will generate between USD1.7 trillion-USD4.5 trillion, and autonomous and semi-autonomous vehicles will generate between USD0.2 trillion-USD1.9 trillion. A report from Accenture examining the potential impact of AI on economic growth found that by 2035, AI could increase the annual growth rate of the U.S. economy by 2percent points, for the 12 countries surveyed in this specific research, AI would promote labor productivity increase rates by 11 percent to 37 percent. Socially, AI can also promote substantial benefits, but just as difficult to quantify as to forecast. The power AI technology has is able to solve problems on a global scale, such as climate change and food insecurity, as well as delivering valuable social benefits, such as assisting authorities to rapidly analyze crimes on the deep web, fighting online bullying and harassment, reducing the influence of gender bias in hiring decisions and in many other areas. In a brief perspective, AI can lead corporations to make better and faster businesses decisions, enhance productivity, drive economy value and create innovation to be applied on new products and services the same way it can generate social value. Many applications already use AI technologies with different algorithms enabling everything from smartphone apps that help consumers with their shopping preferences, to speeding up the time and process of discovering new medical exams. 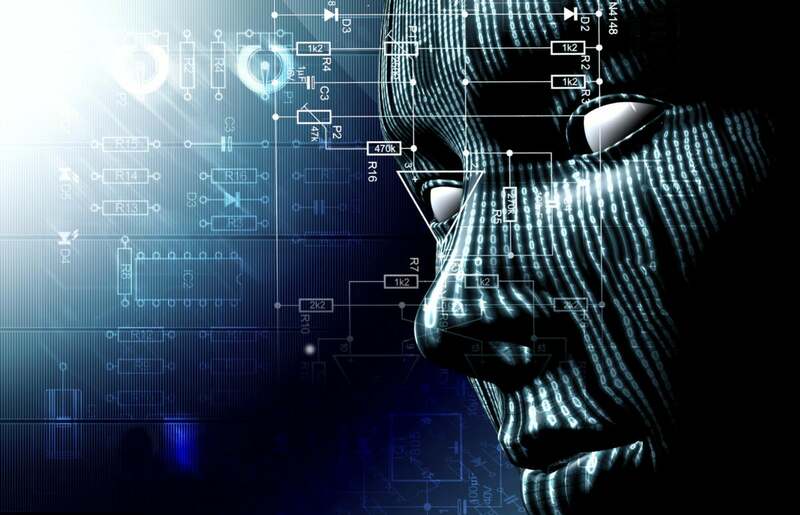 Monitoring: AI technology has the ability to analyze and structure large amounts of data very rapidly, as well as detect abnormalities and patterns. Due to the fact that AI is capable of doing such analysis more quickly and accurately than humans, and usually in real time, it works perfectly for monitoring applications, such as detecting credit-card fraud, cyber security intrusions, medical early diagnostics, or important environmental changes. Discovering:the great ability ofAI technology has to extract valuable insights from large datasets is quite commonly called data mining. Through its analyzing capabilities, AI can discover new solutions through different simulations. Because AI uses dynamic patterns and methodologies that are able to learn and adapt from different data, its efficiency at uncovering abstract patterns and revealing novel insights is quite amazing when compared to that traditional programs. Predicting:another great feature AI technology has is to forecast or create models on how trends are likely to develop within a market or a society in the future, enabling systems to forecast, advise, and personalize responses rapidly. These types of applications are very well known and common, such as Netflix’s recommendation algorithm, which analyzes users’ viewing histories and other factors to suggest new titles that they might like. Many data-intensive applications may benefit from this use of AI, such as precision medicine and weather forecasting. Interpreting:most data analytics has focused on structured data currently, and AI technology is able to learn and identify patterns, so it can interpret unstructured data. As a consequence of this advance, computer systems are now capable of analyzing dramatically more kinds of information about markets, organizations and societies, which can have many different applications for different markets, such as healthcare and legal services. Interaction with Physical Environment: machine-to-environment interactions that allow autonomous systems to directly engage with the physical environment are now becoming more common, and AI can work as a facilitator to this interaction, and that is possible due to the fact that AI enables robotic systems that can navigate and manipulate the environment around them. Autonomous vehicles, for example, analyze large amounts of real-time data from a wide range of sensors, beacons, cameras, GPS systems, and maps to determine the safest and more efficient route to be followed. Interaction with Humans:the other way from what was described above can happen as well, forAI can allow humans to interact in a much easier way with computer systems. Humans typically interact with machines by adjusting their behavior to meet the needs of the computer, such as typing on a keyboard, or adjusting a dial, but AI enables humans to interact with computers the same way they would do with other people, once systems become able to respond to voice, gestures, and even facial and body expressions. Interaction with Machines: another great use of AI is that it can coordinate complicated machine-to-machine interactions automatically. This capability also allows multiple separate AI systems to coordinate with each other, such as a fleet of autonomous trucks managing themselves in a platoon formation to reduce fuel consumption, or autonomous robots in a warehouse that communicate with each other to sort and retrieve items. AI certainly will impact societies and companies within the years ahead by driving a huge and necessary innovation in the public and private sectors, creating great social, organizational and economic value, as well as transforming everyday life around the world. Unfortunately, as it happens with any given new technology, there will be detractors who fear change and how it might impact their lives and their societies. While policymakers should respond to legitimate concerns, they should not allow alarmists to delay progress and remain steadfastly focused on accelerating the development and adoption of AI, given its many certain and potential benefits.